A woman strolling along a New York bridge walks out of frame. We hear her climbing up the cyclone fence enclosure. A man in the distance calls out to her and runs to her aid. The next scene she is being rescued out of the water below, cold and wet. An attempted suicide is a dramatic way to get the audience’s attention. This chronicle concerns a couple, once deeply in love, now forever changed by tragedy. The interrelated stories of husband and wife are woven together as they cope with a devastating loss. 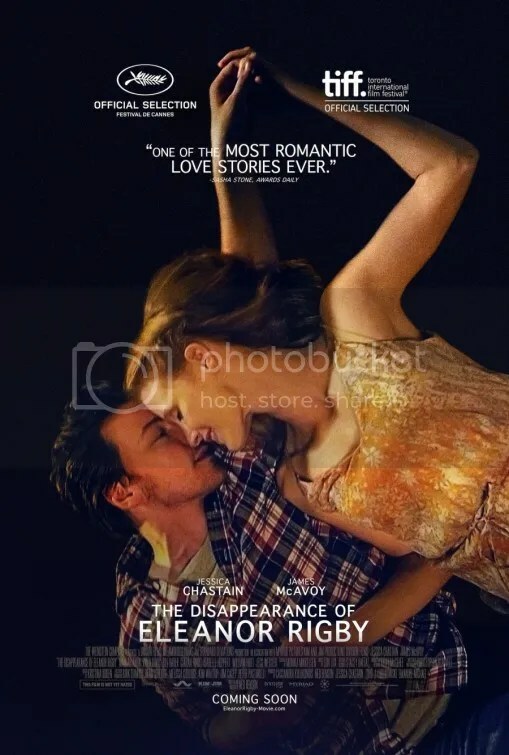 The Disappearance of Eleanor Rigby: Them is actually a combined edit of two separate movies, each with the same title: one subtitled Him the other designated Her. They both screened individually at the Toronto International Film Festival in 2013 as works in progress. The third premiered at Cannes earlier this year when it competed for the Prix Un Certain Regard. The story unfolds a bit like a mystery. We know the pair were in love way back when, but what caused their relationship to fall apart isn’t confirmed until roughly halfway through the picture. Then it becomes more about how different people react in a crisis and what our expectations are of that person. Director Ned Benson has assembled an impressive cast: James McAvoy and Jessica Chastain play our central duo. William Hurt and Isabelle Huppert provide emotional support as Jessica Chastain’s parents. Ciarán Hinds is James McAvoy’s sardonic father. Jess Weixler and Viola Davis display strong bonds as Chastain’s sister and professor respectively. All of them elevate this conventional material into something meaningful. The Disappearance of Eleanor Rigby is a well acted exercise by a talented ensemble. There are some nice vignettes particularly involving Jessica Chastain that effectively amplify her grief. But the picture often descends into melodrama without scratching below the surface. It’s extremely slow moving too, a melancholy portrait that wallows in depression. There’s not much to hold our attention. Even after two hours, there’s still a number of things left unanswered. Given the paper thin narrative on display, it’s difficult to comprehend that Them is the distilled union of two other films. The Him tale is 89 minutes. The Her version is 100 minutes. Considering the time it took for us to learn what little we did, I cannot even muster up the desire to endure another 189 minutes of this tale. This entry was posted on September 24, 2014 at 8:57 pm and is filed under Drama with tags 2014. You can follow any responses to this entry through the RSS 2.0 feed. You can leave a response, or trackback from your own site. I found myself growing restless, too. It was a bit slow. But I still can’t help but wonder what footage we were missing… but at the same time I felt it didn’t really go anywhere until the end-ish scene with the two of them back in the apartment. I kind of wish we got to see more flashbacks of them pre-breakup also. We got the most important parts of each of their stories. The two movies: Him & Her comprise 3 hours of story, so there’s about 60 minutes of missing pieces that further explain their side from each person’s vantage point. Yes, the mood is a bit sluggish. It needs a shot in the arm to bring it to life. You can tell that this is meant to be two different movies, but is just meshed-up into this piece that doesn’t quite work. Although I still look forward to Him and Her, whenever they come around my area. Good review Mark. I don’t see why two films can’t be edited into one. Films are usually shot out of order and then edited together from those separate scenes. Nevertheless something is off. Having sat through this listless two hour film, Them. I can’t say I have any desire to sit through another 3 hours of Him and Her. Great review. I’m really intrigued by this film. The cast mainly does it for me. And hopefully it has something to do with The Beatles, or somberly represents the Revolver song. It references the Beatles only superficially in an offhand comment: Jessica Chastain’s character was so-named because her parents met at a concert where the Beatles were supposed to reunite, but never did. And no that’s not a spoiler. Aw darn. I was expecting at least some somberness in the plot. Maybe someone picking up rice after a wedding, writing a sermon, maybe even darning socks. Started reading the intro to this one and while i’m aware you’re good at not providing spoilers, I think I’d like to see this one before reading the full thing. I have this bookmarked for later!! HOpefuly not too much longer. Intrigued by the pairing of McAvoy and Chastain. I can’t begin to tell you how disappointed I was by this movie. I love both of these actors. Maybe my expectations were too high? I don’t know. Could have been better, with more explanations. Too bad. 2 stars. One for Jessica and one for James. The Disappearance of Eleanor Rigby: Them sounds like a pretty ambitious concept with noble intentions. Seeing how two people react differently in crisis should be a fascinating examination. And from your review it seems like the actors do a tremendous job with the material, but you’re not the first to say it’s boring and wallows in melodrama without mining something deeper, so I’m not planning to catch it anytime soon. Jessica Chastain gives another great performance. I’ll give the movie that. I thought this was getting a theatrical wide release, but I haven’t heard anything about it. Did it just get a short limited release – or go straight to VOD? It got a very limited theatrical release on September 12, 2014. It only played in 139 theaters at its height so not surprising you didn’t know about it.